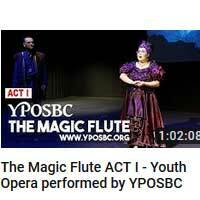 YPOSBC Presents The Magic Flute, by W.A. 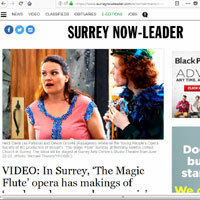 Mozart - Performed at the Surrey Arts Centre Studio Theatre June 22-24, 2018. 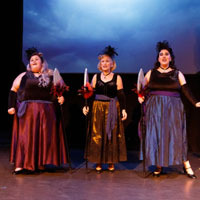 In a mystical land between light and darkness, Prince Tamino is rescued from a ferocious dragon by the mighty magic of the Three Ladies who serve the Queen of the Night. From this moment on begins an adventure to save the Queen's daughter, Pamina, who is held captive by the high priest, Sarastro. 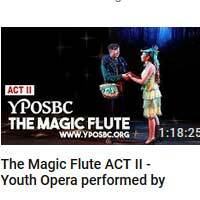 With a magic flute for Tamino and magic silver bells for his newly found and goofy friend, Papageno, they set out to rescue her. Soon, Tamino discovers that Sarastro leads the highest of holy orders, and begins an initiation of trials with his beloved Pamina, to be worthy of the blessings of their goodness and virtue. Magic, struggle, deception and enlightenment are some of the many turns that the path of this adventure takes. It has all the makings of a modern day superhero movie, but in music and song - equally as exciting and acrobatic! 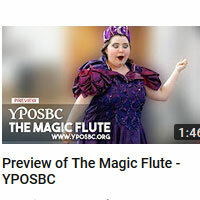 That's opera! 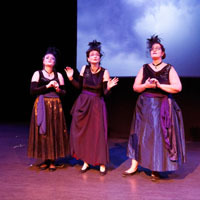 Photos of Cast 1 performance. Photos of Cast 2 performance. 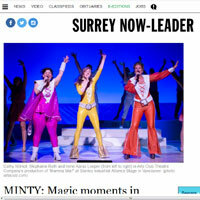 Article with video by the Surrey Now-Leader. Preview video slideshow from rehearsal. Article by the Surrey Now-Leader.